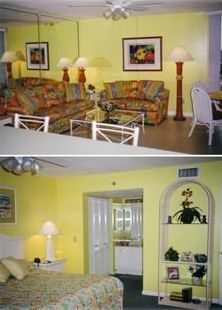 This fabulous, two bedroom, two bath condo features a spectacular view of the Gulf and coastline. Off of the sixth floor private balcony, a 15' mirrored wall in the living area gives you a Gulf view from practically any angle in the condo!!! The most beautiful beach in the world is just a few steps from your door. Mainsail Resort is one of Destin's best. No Pets and No Smoking allowed. Must be over 25 to rent. ID may be checked at gate. All reservations are subject to a phone conversation for approval. Both bathrooms completely remodeled. Walk in shower in master. Bath only. Bring own beach towels.. There are 2 barstools at counter and table and chairs for 4. We have an assortment of books for you to enjoy. Video game room by pool..
(2) New in 2006. Has a children's area with fountain. The 2nd pool at the north end is heated. ** Rental includes 2 beach chairs and an umbrella(Mar.1-Oct.31).24 hour gated security; Absolutely NO SMOKING or Pets Allowed. Must be over 25 to rent Refundable damage deposit required. Great condo with a great view! We had such a great time on our vacation here. Condo is super clean, bathrooms recently remodeled and super nice. View from the balcony is beautiful. Not too far of a walk from the beach. Would definitely stay here again!! WE are directly across the street from Siver Sands Outlet Mall for great shopping and 1 mile from Baytowne Wharf in San Destin for shopping, restaurants and family entertainment. Great restaurants, shopping,golf, fishing, new movie theater within minutes away.